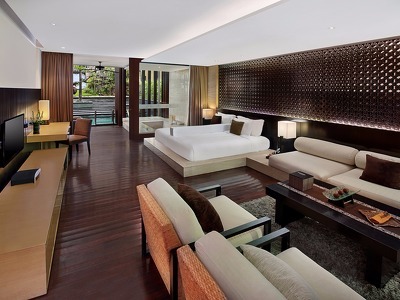 What sets Anantara apart from other hotels in Bali is the all-suite experience. Each suite has been designed using local materials, woods, and glass combining Balinese and Indonesian influences, enhanced by the space allocated to each suite. As well as the hotel's location, the expansive balconies, ocean views, and massive Jacuzzis big enough for two are just some of the features that set this hotel apart from others on the island. There are plenty of options for families too, without compromising on space. Immerse yourself in the elegant ambiance of our eighteen Anantara suites, sleeping two, composed of plush silk cushions and colourful rugs balanced against sleek dark wood floors. Our signature Bali Seminyak suites allow you to soak in the large bath with room for two or under the expansive rainmaker shower while cocooned in a haven of contemporary Balinese design. Soft light floods into the space from your own private balcony with courtyard pool views, illuminating the Balinese wall hangings and imported travertine marbles. Every Anantara Suite comes equipped all the modern conveniences. With direct access to the swimming pool just a step away from your own outdoor bathing terrace, the seven Anantara Pool Access Suites, sleeping two, cater perfectly to the needs of sun lovers who desire a little more privacy. Each of these intimate sanctuaries incorporates contemporary Balinese design, complete with imported travertine marbles, oversized bath tub, rainmaker shower and kingsize bed. While away an afternoon on the outdoor lounger, or retire to the comfort of the air-conditioned living room with indoor sofa and all the modern conveniences. Experience glorious views out across the Indian Ocean from one of the 34 lavish Anantara Ocean Suites, each sleeping two, one of the most desirable accommodation options among Seminyak hotels in Bali. Each Ocean Suite at our stylish Bali beach resort comes with its own private terrace complete with outdoor lounger from which to enjoy these glorious Bali resort vistas. Step inside the 80 square metre living area to experience an exquisite interior in a contemporary Balinese style. Each suite comes complete with such luxuries as travertine marble, a terrazzo tub big enough for two and all the modern conveniences. Stay for a minimum of 3 nights and get 15% off. Stay for a minimum of 4 nights and get 20% off. Stay for a minimum of 5 nights and get 25% off. Offers are all valid for stays in the Anantara Suite, Anantara Pool Access Suite and Anantara Ocean Suite. For the Penthouse, only the 3 and 5 night offers are valid. If you haven't been to Bali then Seminyak is a good place to start, and there is no better place to stay than the award-winning Anantara Seminyak Bali Resort as it has one of the best positions right on the beach and is child-friendly. From here you can explore Bali's culture, discover the island and dip in and out of Seminyak's nightlife. This all-suite luxury hotel has 60 rooms & suites with ocean views, private balconies and more. For most people traveling to Bali is a long journey but one that is absolutely worth it. Whether you are a honeymooner, traveler, Yoga enthusiast or traveling with your family, Bali is one of the most friendly, spiritual and cultural places to come to throughout the year. Anantara Seminyak sits right by the Indian Ocean in a prime beachfront location which is where you will want to be. Water babies can spend the day lazing by the infinity pool or jumping the waves on the beach, and if you want to be pampered in beautiful surroundings then head to the Anantara Spa and try out the Balinese massage- you are in Bali after all! Traditional oils and essences are used as well as Bali coffee beans, powdered spices and natural volcanic pumice. If you want to immerse yourself in Bali's culture then you can join in some of the activities or trips on offer at the hotel which include exploring the island, delving into Balinese culture, learning about the island's spiritual history and more. Balinese food is delicious and some of the best restaurants in Seminyak can be found at Anantara Resort. MoonLite Kitchen and Bar focuses on fine dining with grilled meats and seafood as its speciality, and Wild Orchid serves some of the best Asian food in Bali. Fancy something a bit different? Try Anantara's Dining by Design experience which allows you to have a bespoke dining experience. Set in the centre of Seminyak's entertainment district, Anantara Resort is a 20-minute drive from Kuta Shopping Centre. Ngurah Rai International Airport, 30 minutes by car (Approximately 11km distance). If a cancellation is made within 7 days of the arrival date or in the case of a no-show, 100% of the total price will be charged.